Olympiacos bounced back after a long period of drought in EuroLeague,. Olympiacos snapped a five-game losing streak by beating Buducnost 89 – 76 on the road. This was the first win of Olympiacos after nearly two months. Thanks to this result, the Reds improved to 13 – 12 while Buducnost, that played without center Goga Bitadze, dropped to 6 – 19. It was the superior quality but also the much larger motivation that paced Olympiacos to victory. Behind Nikola Milutinov (15 points, 12 rebounds, 29 PIR), Giorgos Printezis (19 points), Axel Toupane (13 points) and Sasha Vezenkov (12 points, five rebounds), the Greek side dominated all aspects of the game save for a brief stretch in the first quarter and closed halftime up 51 – 34. “We simplified things tonight and one of the reasons that we have been having trouble in this bad streak that we’ve had is that I’ve been doing too many things differently. Me. My fault. The coach. So, this week in practice, we really, really tried to simplify the game and it showed,” Olympiacos coach David Blatt said. Buducnost looked unable to stop the offense of Olympiacos that produced 15 assists and committed just two turnovers in the first twenty minutes. 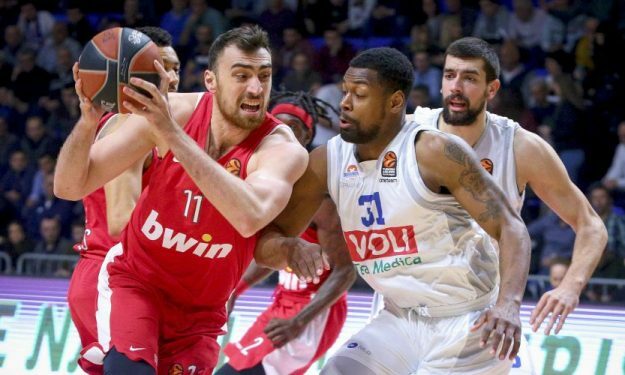 Bitadze’s absence was obvious for the hosts that fell behind even by 24, 39 – 63, four minutes into the second half. Edwin Jackson finished with 13 points and seven assists while Filip Barovic added 13 points and six rebounds.